For the week ending January 16th 2016 King Rich returned to the number one position on the bestseller list for New Zealand fiction. 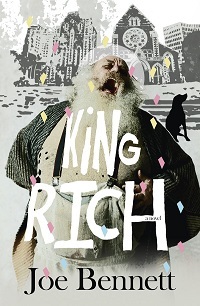 King Rich is still at number 2 on the NZ fiction bestseller list. King Rich is no longer at number 1 on the NZ fiction bestseller list. It is at number 2. At the annual awards night of the New Zealand Magazine Publishers’ Association, held in Auckland, Joe was judged Magazine Columnist of the Year for the column he writes for New Zealand Gardener. He won the same award in 2011. Fish Like a Drink released. At the Canon Media Awards ceremony in Auckland, Joe was awarded the title of New Zealand Columnist of the Year for the fifth time. Paperback edition of 'Hello Dubai' published by Simon and Schuster UK. At dusk he lights the candelabrum, creating an island of light in the centre of the room, animating the faces of the two dressed mannequins, glinting off the cutlery, the long array of glasses, the cellophane wrappers on the biscuits, the chocolate's silver foil. And the margins of the room are lost in the murk, might as well not exist. Richard smiles at the effect, at the little oasis of festivity and commemoration in a wide dark world. Christchurch, days after the February 2011 earthquake. Richard hides, with a lost dog, in an abandoned, leaning hotel. Annie returns from England, seeking a lost father in her battered home town. Vince relives the most significant emotional experience of his life. What binds these lives together, and what tore them apart? Joe Bennett's first novel is the work of a superb writer at the top of his game. Born in England, Joe Bennett has lived in New Zealand since 1987. His newspaper columns are syndicated throughout the country and on five occasions he has been judged New Zealand Columnist of the Year, most recently in 2011. Thirteen collections of his columns have been published in New Zealand and three world-wide. He has had four travel books published by Simon and Schuster UK, and his work has been translated into Chinese, Korean, Greek and American. 'Where Underpants Come From' was the Whitcoulls Travcom Travel Book of the Year in 2009.